Provide clarity for placement of Extended Scope of Practice (ESP) Paramedics to provide advanced back up on complex trauma and medical patients, as well as manage specific high risk patient events and critical care transports. ESP Paramedics are trained as advanced practice providers, able to function as the “hands, eyes, and ears” of the physician, providing advanced decision making, advanced diagnostics, and advanced care under the direct authority of a specific physician through online and offline medical direction. The focus of these resources are to improve neurologically and functionally intact survival in the patient population through application of advanced medications and procedures. This system of advanced providers has shown dramatic results in Washington, Oregon, Victoria, South Africa, and Raleigh. In King County Washington, the Portland Metropolitan Area in Oregon, and Clark County Nevada during the past ten years, there has been an ever increasing rate of neurologically intact survival from cardiac arrest, functionally intact recovery from trauma, and functionally intact recovery from myocardial infarction and cerebral vascular accidents. With all three system being top performing EMS systems in the world, and the King County Medic One system taking firm hold as the top performing EMS system in the world today with cardiac arrest neurologically intact survival exceeding 50% in 2013! For an EMS system to become a world leader in EMS and match the results of the highest performing EMS systems in the world, there must be a unique, close, and intimate integration of clinical governance, education, and operations management similar to the methodologies utilized in the three systems discussed above, because only through acknowledgement of the equal footing of medical direction and operations can an EMS system be successful in advanced practice. EMS systems can move to a high fidelity, high performance, and high impact model with the implementation of a tiered response system with a small group of paramedics functioning at an extended scope of practice which mirrors the scope of paramedics in several high-performance systems. This small cadre of Medical Director approved and mentored ESP providers to provide a supplemental paramedic with a high frequency of critical patient care encounters to augment the care being provided by our outstanding ambulance-based EMS providers and provide those advanced interventions that must be done right now or the patient will perish. As discussed at the International science symposium (1a, 1b, 1c, 1d), full application of the immediate post cardiac arrest algorithm, advanced preparation steps for PCI, and direct PCI admission can improve cardiac arrest survival from 27% to 43%! With an average of 40 cardiac arrest incidents treated a month by National Ambulance, this level of intervention combined with rapid defibrillation and CPR from first in units and the general public (through increased public response with the use of PulsePoint) would result in a potential 206 neurologically intact cardiac arrest survivors due to National Ambulance! While the use of standard paramedic interventions make a large impact on patient’s suffering ventricular fibrillation arrest, only through application of advanced techniques can the patient in PEA arrest have an equal chance at survival, by the application of a modified approach to the PEA patient, rapid intervention is possible to improve lives saved (2a). In the current lexicon of trauma, Damage Control Resuscitation (DCR) has been the standard of care since 2008 in the military medical systems worldwide for the 3-8% of trauma patients on the edge of physiologic exhaustion and cardiac arrest; but only through application of advanced techniques (3a, 3c, 3d, 3e, 3f), can these patients experience the dramatic recovery rates (approaching 7%3b in traumatic arrest and 80% in multisystem trauma) shown in high performance EMS systems within South Africa and the United States. 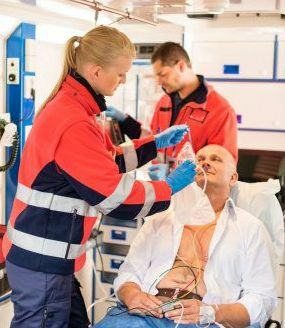 The addition of blood products for specific trauma patients allows the ESP paramedic to again increase survival (3g, 3h), when coupled with ultrasound identification of specific traumatic injuries, the ESP paramedic will be able to reduce some injury fatality rates by as much as 50% (5a, 5b, 5c). Personnel must apply for the available positions and attend a training/selection academy on their own time. The Medical Director appoints a single supervising educator for the program, this individual works directly with the advanced personnel as the medical director’s designee and intimately with operations to develop an effective team of personnel while guiding and assessing their education and clinical competencies in the classroom and field. The supervising training officer selects field training officers at a ratio of 10:1 for the advanced practice personnel, these FTO personnel work as shift personnel, but report to the Medical Director and Supervising Educator. No additional monetary compensation is offered to these personnel, the only return for their time and investment in their clinical practice is dramatically increased training opportunities, field mentoring, the addition of three “education days” to their leave time per year, and a small increase in work schedule privileges. Fiscal impacts to the healthcare system can exceed $2,000,000 per patient who is converted from a disabled state to a fully functional state by the application of these techniques. In the United States, the CDC estimates that in 2000 the medical costs and indirect costs (lost productivity) of TBI in United States totaled $60 billion, with extended care for comatose patients exceeded $1,000 usd/day. The Markov model estimated rehabilitation costs of $1.4 million and nursing home cost of $4.8 million per long term maintenance patient care; and the American Heart Association estimated significant savings in their “Cost and Outcome of Mechanical Ventilation for Life-Threatening Stroke” consensus statement for patients whose functionality could be improved rather than long term care being required. This process also applies to the post cardiac arrest and trauma patient populations.